LAS VEGAS — Yoeli Childs scored a career-high 33 points to lead BYU over No. 20 Saint Mary’s 85-72 in Monday night’s West Coast Conference Tournament semifinals. Jordan Ford led Saint Mary’s (28-5) with 27 points and six rebounds. 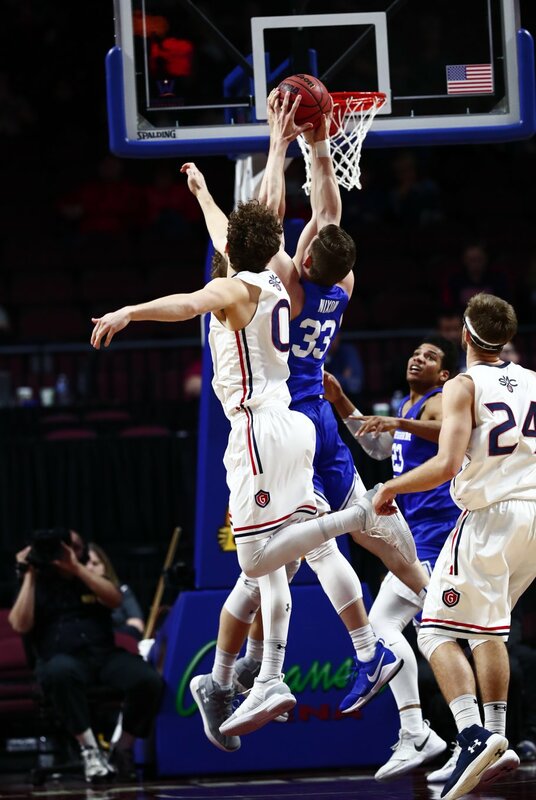 The Gaels’ Jock Landale, who fouled out with 21 seconds left, had 23 points, but only four rebounds. Landale committed his third foul with 1:49 left before halftime and fourth with 8:39 left in the game. Despite the Gaels getting on the board first, the Cougars went on an 11-2 run, including five in a row by Bryant to give BYU an 11-4 advantage with 15:13 left on the clock. A 6-0 run by Saint Mary’s brought the game within one, 11-10 with 13 minutes to go in the first half. After a layup by Childs, the Gaels answered with back-to-back baskets to take a 15-13 lead. The two teams exchanged the lead throughout three minutes of play and were tied at 25-all with 8:19 to go. Saint Mary’s took a four-point lead before back-to-back steals helped the Cougars tie the game at 31-all with under five minutes to go before halftime. Nixon converted on a three-point play to give BYU the lead again, 36-35 with two minutes on the clock. A trey by Childs as the clock ran out sent the two teams into the locker room with the Cougars on top 41-37. BYU shot 60.7 percent from the field, 57.1 percent from beyond the arc and 100.0 percent from the free-throw line in the first half. The Gaels recorded 51.9 percent from the field, 35.7 percent from the perimeter and 66.7 percent from the charity stripe. The second half started off with a layup by Bryant and a dunk by Childs to give the Cougars a 45-37 lead early on. The Cougars consistently stayed on top by at least two possessions throughout the majority of the early minutes of the second half. The Gaels answered with two consecutive baskets to bring the game within one, 55-54, with 11:14 on the clock. A 12-0 run over a three-minute span extended the BYU lead to double-digits, 67-54, respectively. With 7:07 left in the game, Saint Mary’s ended the run by the Cougars, but was quickly answered with a steal by McKay Cannon and a dunk by Nixon. Back-to-back jumpers by Haws and Bryant kept BYU on top by 10, 75-65 with 2:27 on the clock, forcing a timeout by the Gaels. In the final minute of the game, Bryant went 6 of 6 from the line and Childs added two as the Cougars secured an 85-72 win to advance to the finals of the WCC Championships. BYU ended the game shooting 61.1 percent from the field, 45.5 percent from three and 87.5 percent from the line. Saint Mary’s shot 50.0 percent from the field, 30.8 percent from beyond the arc and 80.0 percent from the free-throw line. The Cougars take on No. 6 and top-seeded Gonzaga in the championship game Tuesday, March 6, at 6 p.m. PST in the Orleans Arena. Live coverage will be available on ESPN. 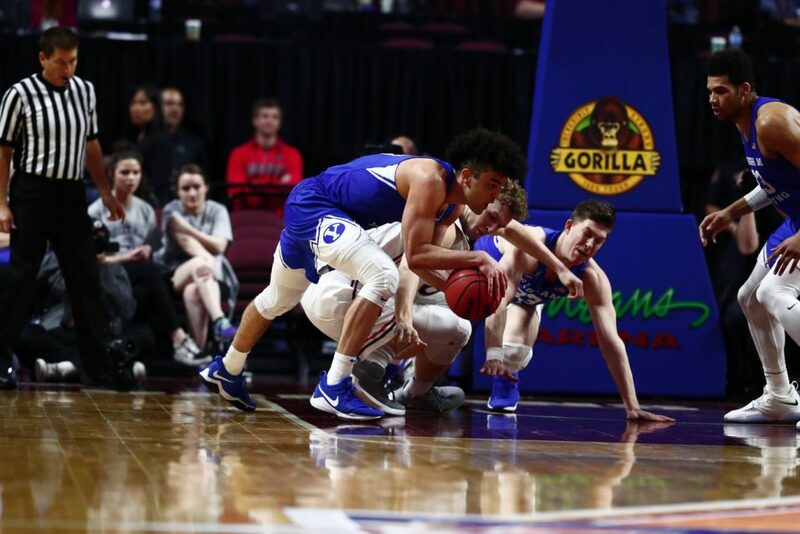 Audio broadcasts can be heard on BYU Radio (Sirius XM 143), BYU Sports Network and Easy 101.5 in St. George. BYU: The Cougars play in the WCC finals against Gonzaga Tuesday night. Saint Mary’s: The Gaels are expected to receive an NCAA Tournament bid.